And Finally my research is happening and I am making an other stop motion work with a great illustrator based on Japanese myth and I will send the information soon! So yes … Board games … I’d been introduced to the “Dice tower” pod casting episodes and I LOVED it … and it was interesting how fun and great was listening to the review of the games and all the discussions and … every thing about it was cool. So many people know “Mahjong” but deep of this game is slightly different and so many other meaning that I will work on it in my new blog. A great deal of bunkum has been written about the origin of Mah Jong. Both the Chinese, and later, the rest of the world decided to embellish the truth liberally and outrageously for nefarious purposes and the result has been a number of spurious assertions for the game’s history. As usual with Chinese games, one theory has it that Confucious invented it and mystical histories of hundreds and even thousands of years have been claimed often by western tradesmen keen to impress their potential customers. All this is very unlikely because the stark truth is that no evidence of the game exists before around 1880. In fact, the history of the game is straightforward and can be viewed in two parts – “until the early 1920s” when the game was almost exclusively played by the Chinese and “after the early 1920s” when the game was discovered and immediately popularised by other nations. 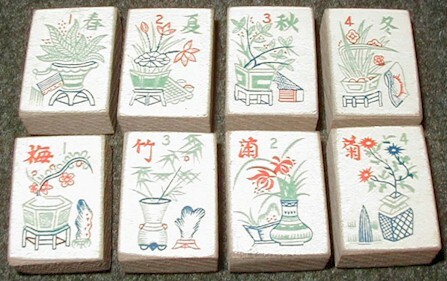 A set of 144 Mah Jong tiles consists of 36 tiles in the Bamboo suit, 36 in the Circle suit, 36 in the Character suit, 16 Wind tiles, 12 Dragon tiles and 8 bonus tiles (4 Flowers and 4 Seasons). The best tiles are made from bamboo and ivory or bone and have beautiful hand-painted pictures representing the face of each tile. Traditionally, the Flowers, Seasons and the One of Bamboos come in for particular artistic creativity. The aim is to collect sets of tiles according to the number and type shown on the face of each tile. A player takes and discards a tile each turn and the first player whose hand consists entirely of a legal set or sets goes out or goes “Mah Jong”. The game is effectively the same as the card game Rummy, in fact. For what always appears initially to be a very complicated game, Mah Jong is really remarkably simple when reduced to its basics and it is only the accompanying rituals and complex scoring that change this. One of these rituals, the process of shuffling the tiles at the start of the game, is known as “The twittering of the sparrows”, presumably because of the accompanying noise. Since Mah Jong means “the game of the sparrows” or “Sparrow tiles” in Chinese, it seems likely that this is the source of the game’s title. The three pictures on this page show an early British Chad Valley game from around 1923/24. Across the top of the box lid can be seen a very dubious assertion. The tiles are wooden but for a low quality set, the Flowers and Seasons are fairly decorate. Tile games of some form have been found from around 1120 AD in China and Chinese dominoes has been played for centuries in that region. For more information, see the history of Dominoes. Mah Jong, however, bears a much greater resemblance in play to certain card games, namely those of the Rummy family. 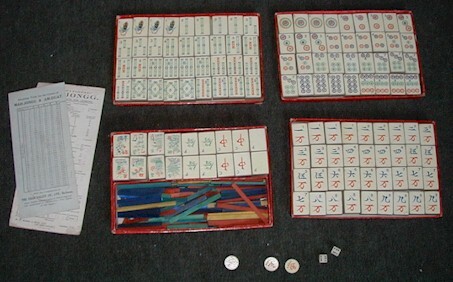 Prior to the appearance of Mah Jong, a variety of card games were played in China with at least four types of cards decks. However, just like Mah Jong the majority were of the set-collecting variety and certain terms from these old card games are also used in Mah Jong. So, it seems not unreasonable to place Mah Jong as a nephew of those card games. There is good evidence from Chinese researchers that Mah Jong originated in the provinces of Kiangsu, Anhwei and Chekiang near Shanghai because no records of Mah Jong are found in any other part of China before 1900. Beyond that, one theory from Canton states that the inventor was Hung Hsiu-Ch’uan, the Cantonese who led a rebellion and proclaimed himself Emperor of Nanking. It’s certainly feasible that the game appeared in his court which was famous for its hedonistic pursuit of pleasure and entertainment. A rival theory believes that the inventor was an inhabitant of Ningpo in Chekiang which is famous for its ivory carving. It is believably claimed that playing cards used for an earlier game were for the first time recreated as ivory tablets here. 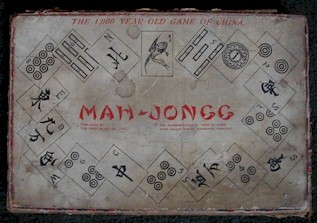 A third, credits a pair of brothers in Ningpo with the act of transposing playing cards used for the game of Ma-Tiao onto ivory and bamboo about 1870 or 1880 and advances that a magistrate of Chekiang province became an enthusiast who promoted the game and made it popular throughout Chekiang. A quite detailed account of this was given by one T. E. Pun and there is no doubt that Ma-Tiao is similar enough to Mah Jong to be reasonably certain that it is, indeed, its direct ancestor. More cynical authors note that the Chinese term for card, “P’ai”, actually simply means “playing rectangle” and the same word is used for such objects whether they be made of paper, card, bamboo, bone, ivory or any other solid material. Evidence shows that many P’ai games recorded through history had always been played on both tiles and cards interchangeably. This certainly spoils a good story but it is just as likely that no “invention” ever really took place and that a much more blurred development is the fact of the matter. Regardless, the game that sprang from this area of China, almost certainly a descendant of the card game Ma-Tiao, was initially somewhat rough around the edges. In 1905, Mah Jong was not really known outside its original area but over the next 15 years it spread incredibly quickly across most of China and in doing so supplanted Chess as the most popular Chinese game. The Chinese gradually removed the inelegant elements of game play and incorporated a bevy of rituals surrounding the method of play that have now become enshrined in stone. Most of these rituals occur at the start of the game and are to do with the shuffling, the building of the four walls in a square, the deal and the splitting of the wall to form the “Kong box”. To a beginner, they seem mystifying and unnecessary but the truth is that Mah Jong is, by origin, a gambling game and most of these elements prevent cheating very effectively, a factor that is important when the stakes are high….. When the West “discovered” the game around 1920 the Mah Jong craze enlarged by another factor again to encompass much of the world. Many regions in the Far East play a game akin to the classical Chinese form but in particular, the British, the Americans and the Japanese all grabbed the game and ran with it in their own direction. Mah Jong first hit Japan in 1907 and, like North America and the British Empire, became a fad in the 1920s. A similar but less dramatic experience to that of America occurred in that the initial game was simplified and then complicated again with new rules. However, the Japanese managed to do this without completely altering the underlying nature of the game and thus the game has remained steadily popular. Japanese rules take two general forms – those adopted officially by the Japanese Mah Jong Association and “riichi”, all the unofficial but sometimes more popular versions played by casual players. However, the main differences from the classical Chinese game are consistent in both. The primary modification is that the winner is paid by all players so that there are no points for second place. Unlike other variants, therefore, each Japanese round is an all-out race to be the first to go Mah Jong as opposed to a more careful campaign with the long term objective of amassing the greatest number of points over a series of games. Mah Jong was taken to America by Joseph P. Babcock who began importing sets in bulk to the USA in 1922. In order to make it a commercial success, Babcock heavily simplified the rules, many of the interesting intricacies of play being removed. While this worked to a degree because the game did indeed become popular very quickly, Americans were not satisfied for long with this version. Consequently they began to embellish it, by the addition of an array of weird and wonderful “special hands” that allowed one to go Mah Jong and other new rules supposed to increase the enjoyment. The result was confusion. The two most popular variations of the game in 1924 were the One-Double and the Cleared-Hand games and little was known of the classical form from China. While superficially more enjoyable, after a short time, people lost interest in these games and consequently, the Mah Jong bubble burst. In 1935, the game began to gain again in popularity in America based on newly published rules from the The National Mah Jong League Inc. who still claim to produce the “official” American rules. Unfortunately, rather than go back to the essence of the original form, the same error was repeated and an effort to simply fix the flawed existing American games was made. This complicated and pushed American Mah Jong even further from the original form. Indeed, it is now so different from the original Mah Jong that it is effectively a different game, its most notable feature being the enormous number of legal special hands. In Britain, an explosion of interest occurred about the same time as the initial bubble in America and this was mirrored in many other parts of the British Empire, especially in India. For instance, Chad Valley first published the game in 1923. Both the American and the Chinese forms were played but, unlike most Americans, the British understood that the Chinese version was the “real” game and that the American and other versions were modern forms. The most popular variations were based on semi-official rules in circulation – The Queens Club Rules and the rules laid down in a booklet by C.M.W Higginson. Both of these were based on Chinese variants which probably accounts for the fact that the game remained popular in Britain well into the 1930s – considerably longer than in America – although interest dwindled between the wars. Nowadays, although the usual proliferation of rules exists, the British Mah Jong Federation publish a set of rules that are a distillation of the way that Mah Jong has been played in Britain during the 20th century and these rules are closer to the Chinese game than the Japanese or American varieties. The main differences are that only one Chow is allowed per person per round and that a few additional special hands are permitted. A variety of Mah Jong Sets from Masters Traditional Game Shop. Masters Traditional Games provides free game rules based on the original Chinese and British games. Japanese Mah Jong Rules by Laurent Delfosse. Mah Jong Museum has Traditional Mah Jong rules and Filipino/Taiwanese rules. I’m not sure how close traditional rules are to the Chinese game. I’ve yet to find a complete set of American rules on the Interenet although the AMJA ought to be able to help. A site specifically about the Rules of British Mah Jong.